The proven way to engage and convert the audience is using video marketing. But there are some potential pitfalls in video marketing. Mistakes are bound to happen if you are just trying your hand at video marketing or a have a lot of experience. 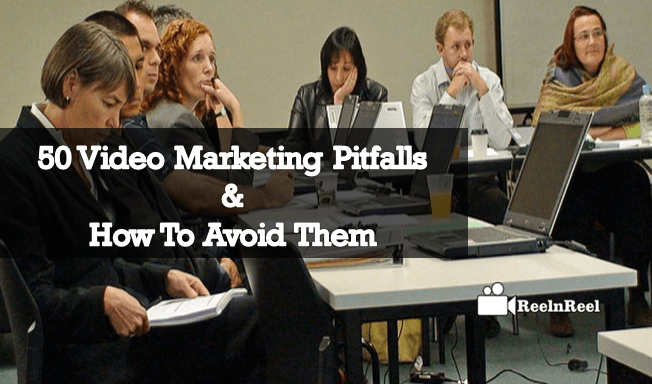 Go through the list of video marketing pitfall and some tips to avoid them. Do not go ahead without analysing who your ideal customers are. Discuss with your marketing team. Do not promote content without actually knowing what type of content that your ideal customers prefer is. Check what Millennials prefer the length of the video is and by gen-zeros is. Marketing videos should not only be embedded on the website or only one platform. Find the platform where your ideal customer’s hang out. Have a social campaign around the marketing videos and share them many times across the platforms target audiences are. Do not expect to become an expert content creator overnight. Take time and work hard. Many B2B marketers feel that video marketing is not for them, but they can use humour in their marketing videos to deliver the message, and the engage the audience. Marketing videos should not always try to sell the product, but they should be able to build relationships with the audience. Do not try using flashy or exciting words in the title. Try engaging those who are interested in your products. Do not try to use poor titles and auto-generated thumbnails, instead, do some research and include trending words in titles and customise thumbnails. Do not misguide the audience with titles and thumbnails but use right titles and relevant thumbnails. Though videos are engaging do not just use them for the sake of it unless they fit into the marketing strategy. Do not try to deliver a lot of messages in your single video have only one clear message. Since the attention span of human beings these days is only eight seconds, try to get to the point of the video from the beginning. Do not shoot long videos but only have videos of maximum fifteen to twenty seconds long video. If the video is long cut it into smaller pieces and post them as video series which makes the audience come back. Video marketing should not be at the top of the sales funnel but should be used at every step of the funnel. Ignoring Call to actions is a big mistake which should avoid. Right CTA can boost the success of the marketing video. Do not fade the video to black at the end of it, but include a CTA to take the audience to the next step of the content journey. Powerful CTA can be directing the audience to sales home page, watching another video, downloading an e-book etc. Use email gates to get information about your audience. How to know if a video is performing as expected or not? It is to check the video analytics. Know what the audience is watching, how much time they are spending and which part of the video they are watching. Video analytics help to get the information of leads and the interests of the customers. Do not neglect video analytics but find the best performing content and make changes to the future content. Do not make the mistake of not integrating the video with marketing automation. Having no story in the marketing video is another great mistake done by the brands which should be avoided by telling stories in the videos making them memorable. If you are making an explainer video mention the problem, offer a solution to it and tell the benefits of using your product or services. Over thinking about every minute detail of the video is another mistake as this can lead to the end product becoming very boring. Do not create videos similar to the viral videos, ensure that the video is unique. Videos can be created either by yourself or taking the help of professionals, but make sure that they are of high quality. The mistake committed by many marketers is to have videos that are not of low quality, this can risk your brand reputation. Make sure that you only have high-quality videos which will be watched by more and more audience. Concentrate on the last few seconds of the video and tell the customers how the service or product can help make their lives better. Neglecting social media marketing is a great pitfall for video marketers. Marketing videos should be promoted like crazy to get mileage. Share the marketing videos on social media sites so that the video gets best chances to gain attention. There is an option to promote the video on social sites with paid campaigns. Try finding out more about paid campaigns on YouTube and Facebook without neglecting. Do not ignore the benefits of having a blog for your videos as this helps in connecting with a different audience. Not considering video marketing as the extension of the brand is a mistake, do not treat video marketing as a different project. Skipping the SEO is another pitfall, SEO is one of the greatest ways through which people can find the content easily. Not filling the metadata sections of the video when uploading to YouTube or Vimeo is one mistake that should be avoided. Do not talk too much about the brand but create videos that should guide the leads through sales journey. Not including trending and top keywords in the title, descriptions and tags should be avoided, examples of relevant keywords are animation or explainer video. Another big mistake is to choose the wrong video platform to get most out of the efforts put. Not finding what each platform can offer to video marketing is another mistake, be aware of how the platform can help reach the goals. Not looking into video platform options should be avoided, choose the platform that fits for the business and marketing goals. Not aware of exploding the brand name that exactly reaches the audience, i.e. for supposing when you launch the video marketing campaign that goes viral but no one remembers the name of your company. This can be avoided by participation on social media frequently. No proper presentation of the purpose of video campaign that has been launched. Here the audience might not understand overall theme of the campaign. Make clear figure to reach them. Deficiency of resources. Just make sure to have the resources that are needed to fulfill while launching the video campaign. Video marketing is the most powerful marketing tool. Making mistakes in this can destroy the chances of getting success. Read the above to learn the most common mistakes made by the brands and businesses over and over again and how to avoid them.